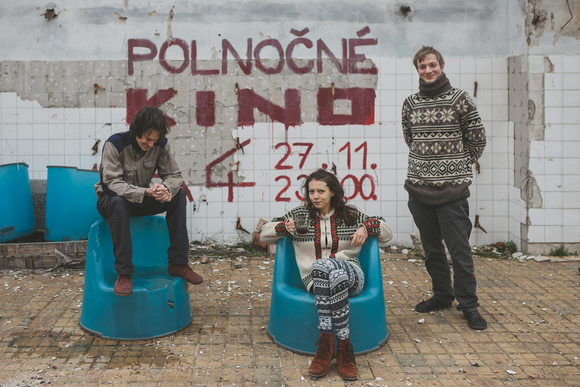 Núku is a band formed at the beginning of fall 2015, but includes experienced musicians: Adam Dekan (synths), Alex Lukáčová (vocals) and Martin Madro (percussions). The band is well known for their live shows which are full of energy, improvisation and pioneering of live electronic performance. Krútňava means whirlpool, and that is how you are supposed to feel while listening to this album. It contains 8 colorful songs that cross genres without hesitation but the result works surprisingly well. It was made by three musicians who don’t care about fitting a certain style. Adam explores sounds and creates complex arrangements with his beloved modular synthesizer. Martin creates absorbing rhythm patterns using electronic drum pads and acoustic percussions. Alex likes to play with her voice and writes poetic stories full of metaphors, enjoying the beauty of her native Slovak language. The result is slightly trippy and surreal. The mixture of electro-acoustic sounds and emotional vocals offers dreamy, sometimes gloomy moods. Overall, it’s a positive, playful album made to bring joy to an open minded listener.